New laws to govern debate during marriage equality survey. CANBERRA -- Making offensive comments based on someone's sexuality or religion during the marriage equality postal survey could net you a $12,000 fine, under new laws to be introduced to parliament this week. The government will extend extra protections to the marriage survey in an attempt to protect campaigners on both sides from vilification, intimidation or threats of harm from opponents. Because the marriage equality vote is a postal survey, and not a properly legislated plebiscite or election, the normal protections that apply at elections -- such as those governing political advertisements -- do not apply. 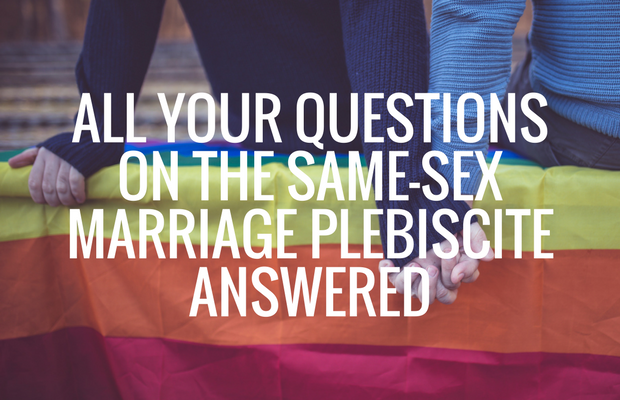 With a number of offensive contributions to the marriage debate, such as misleading and vile posters found in Melbourne, the government has been under pressure to extend those normal election protections to the postal survey. The Coalition partyroom has agreed on a bill which would import the standard provisions regarding conduct during election campaigns from the Electoral Act to the marriage survey. Also in the bill are additional safeguards, which would make it an offence to vilify, intimidate or threaten to cause harm to a person based on their sexual orientation, gender identity, intersex status or religious conviction. This would protect both LGBTQ groups leading the 'yes' vote and church groups pushing for a 'no' result. The laws are planned to be introduced into parliament this week, with hopes they will pass by the end of the week, with time being a factor as the postal survey forms will begin arriving in letterboxes nationwide from Tuesday. The penalty for breaching this law, which will have a 'sunset provision' and only run for the period of the postal survey, would be 60 penalty units -- at $210 a unit, this gives the potential for a fine of up to $12,600. The law would also include an injunction power, to stop the publication or broadcast of content which breaches the protections. It is understood that this law would extend beyond advertising or editorial material, referring to "conduct" which could feasibly include online content such as blog posts or tweets. Attorney-General George Brandis would be appointed as a 'gatekeeper' around these protections, however, and would need to give consent before any legal action was taken in regards to conduct which allegedly breaches the laws. It is understood Brandis would consider these claims with a view to allowing freedom of speech. The debate around the marriage survey so far has so concerned the National Mental Health Commission that, on Monday, it released a statement expressing "alarm" at the detrimental mental health impacts of the marriage equality debate, particularly "damaging, emotive mistruths" being spread about the LGBTQ community. This was swiftly followed by government senator and former minister Matt Canavan decrying those complaining about the tone of the debate as "delicate little flowers" who need to "just grow a spine". The laws will be introduced to parliament this week.